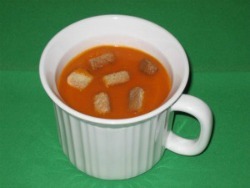 This delicious diet tomato soup recipe is easy to make and cost less than ten dollars to whip up an entire pot. A healthy choice that is smart on the pocket book and the waistline. Many consider the tomato a vegetable but this plump juicy food is actually from the fruit family. It doesn’t really matter how they are labeled because they are packed full of antioxidants such as beta-carotene, lycopene and Vitamins C and E that offer a variety of health benefits. In a large soup pot melt the butter over medium heat and add the onions, garlic, carrots, celery, bay leaves, thyme and a pinch of salt and pepper, sautéing ingredients for about 7 – 9 minutes. 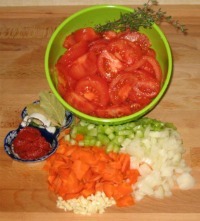 Then add the chopped tomatoes tomatoes and tomato paste and continue to sauté for another 10 minutes over medium heat. This helps the tomatoes release their juices. Add the chicken broth and turn stove to high heat and bring to a boil, then reduce heat to low and simmer covered for about 30 minutes or until all vegetables are tender, then remove from heat. Scoop out the soup in batches and puree in a food processor or blender. If you have a hand held immersion blender you can puree the ingredients directly in the pot. Make sure the soup has cooled enough before blending to avoid the possible spatter of burning hot soup on the skin. Once the soup has been pureed it must be pushed through a sieve to get rid of the tomato skins and seeds. Place the sieve over a large bowl and ladle the soup into the sieve. Then use the back of the ladle or a large spoon to push the ingredients through the sieve into the bowl. Add salt and pepper to taste if needed. You can transfer it back into the pot for reheating or store it in the fridge for later use. This Tomato Soup Recipe Makes 4 Servings. If you make 4 servings out of this recipe, each serving would be approximately 128 calories. Of course if you only enjoy a cup of this soup for a snack the calorie count is even lower. As always we would like to add this useful tip. If you do not have any chicken broth on hand just substitute the broth for water and add 2 chicken bouillon cubes. This comes in handy if you’re low on supplies or strapped for time. If you find the soup too thick just add more broth (or water). For those who prefer their tomato soup a little sweet you can add a little sugar to it.